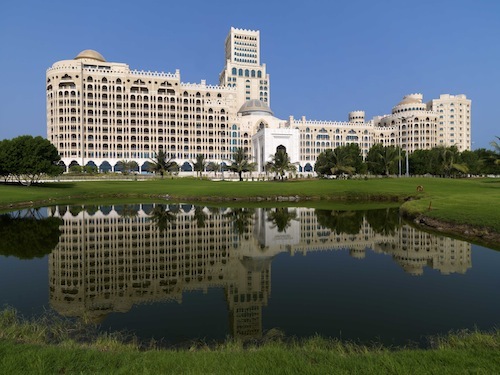 Waldorf Astoria Hotels & Resorts, Hilton Worldwide’s luxury brand of landmark hotels, has announced the opening of Waldorf Astoria Ras Al Khaimah, the brand’s first hotel in the UAE and the 25th addition to the global Waldorf Astoria portfolio of 25 hotels and resorts, globally. Offering sweeping views of the Arabian Gulf, the highly anticipated 346-room Waldorf Astoria Ras Al Khaimah will delight connoisseurs of luxury with many distinctive features and amenities designed to bring the luxury and sophistication of Waldorf Astoria to the award-winning Emirate of Ras Al Khaimah for the first time. Exclusively designed to mirror the magnificent classic features of an Arabian palace, Waldorf Astoria Ras Al Khaimah boasts a wealth of experiences and services including beautifully designed & incredibly spacious rooms and suites, a first-class 18-hole championship golf course, a stunning 350-metre private beach and two temperature-controlled outdoor pools. Dining aficionados can select from an impressive choice of four signature restaurants including speciality dining from US steakhouse, The Lexington Grill, Japanese dining Umi and Emirati-inspired cuisine at Marjan. The hotel also offers six exclusive entertainment and dining venues including Camelia, a traditional tea lounge; an intimate and exclusive nightclub; Waldorf’s famous cigar bar and a choice of outdoor dining courtesy of Azure and Al Fayrouz – all reflecting the authenticity of individual cultures and styles. For ultimate relaxation and wellbeing, Waldorf Astoria Ras Al Khaimah also offers a Waldorf Astoria Spa, one of the Emirate’s largest Spas, featuring an impressive 1650 square metres of tranquil surroundings with 12 luxurious bespoke treatment rooms as well as a VIP room in which an array of treatments incorporating indigenous herbs and rituals will be offered. Waldorf Astoria Ras Al Khaimah is also destined to become a corporate favourite for meetings as well as business and social gatherings. With four state of the art meeting rooms, separate boardroom and a fully equipped business centre, the hotel is also complemented by a range of exclusive and versatile outdoor event venues ideally placed for cocktail parties, soirees and intimate gatherings. Notably, the hotel also includes two of Waldorf Astoria’s famous brand signatures – a grand lobby clock and Peacock Alley, a public area that will become a hub for socialising. Inspired by the legendary Waldorf Astoria hotel in New York, Waldorf Astoria Ras Al Khaimah clock has been exclusively designed to honour regional Arab culture and will include the five daily prayer times. Peacock Alley, located across ground floor and mezzanine levels, is reflective of the grand social promenade that connected the original Waldorf and Astoria hotels in New York – as a place to see and be seen. Ras Al Khaimah, UAE is rapidly becoming a popular choice among a growing number of perceptive travellers seeking an authentic Emirati experience, whether it be leisure, adventure or cultural. Located just 45 minutes from one of the world’s fastest growing airports in Dubai, Ras Al Khaimah boasts majestic mountain ranges, expanses of red sandy desert and lush green plains along a series of creeks and lagoons. Charming historic sites, forts and abandoned villages also echo the Emirate’s 5000-year heritage and add to the overall distinctive appeal of Ras Al Khaimah.